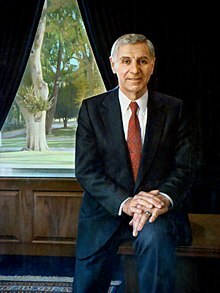 Courken George Deukmejian Jr. (/djuːkˈmeɪdʒən/; June 6, 1928 – May 8, 2018) was an American politician who was the 35th Governor of California from 1983 to 1991 and Attorney General of California from 1979 to 1983. Deukmejian was the first and so far the only governor of Armenian descent of a U.S. state. Deukmejian was born Courken George Deukmejian Jr. in Menands, New York. His parents were Armenians who emigrated from the Ottoman Empire in the early 1900s to escape the Armenian Genocide. His father, George Deukmejian, who lost his sister during the Genocide, was a rug merchant born in Gaziantep. Deukmejian's mother, Alice Gairden, was born in Erzurum and worked for Montgomery Ward and later for New York State. Deukmejian graduated with a B.A. in Sociology from Siena College in 1949. He then earned a Juris Doctor (J.D.) from St. John's University in 1952. From 1953 to 1955, he served in the U.S. Army, assigned to the Judge Advocate General's Corps. Deukmejian moved to California in 1955 where his sister, Anna Ashjian, introduced him to his future wife Gloria Saatjian, a bank teller whose parents were also immigrants from Armenia. They married on February 16, 1957 and had three children: two daughters, born in 1964 and 1969; and one son, born in 1966. Deukmejian entered politics in California after a short period of private practice in Long Beach alongside Malcolm M. Lucas. In 1962, was elected to represent Long Beach in the State Assembly. In 1966, he was elected as a state senator, serving from 1967 to 1979. He was a high-profile advocate for capital punishment. By 1969, he was the Majority Leader of the California State Senate. He first ran for Attorney General of California in 1970, finishing fourth in the Republican primary. He won the election for Attorney General in 1978 and served from 1979 to 1983. During this time, he led a high-profile campaign against cannabis in northern California. Additionally, he led a veto override against Governor Jerry Brown who had vetoed legislation to authorize the death penalty. Deukmejian was elected in 1982 to his first term as Governor of California, defeating Lieutenant Governor Mike Curb, a recording company owner, in the Republican primary. One of his early primary backers was former gubernatorial candidate Joe Shell of Bakersfield, California, a conservative who had opposed Richard M. Nixon in the 1962 primary. Upon his victory, The New York Times published, "The image that comes across of Mr. Deukmejian - a devoted family man, an Episcopal churchman, an ice cream lover - led one reporter to write, ''California may have accidentally elected Iowa's Governor.''" In the general election, Deukmejian ran as a conservative supporter of public safety and balanced budgets. In addition, he was strongly critical of outgoing Governor Jerry Brown and promised to run a very different administration. He also strongly criticized the Supreme Court of California, which was dominated by Brown appointees, notably controversial Chief Justice Rose Bird. Deukmejian narrowly defeated Los Angeles Mayor Tom Bradley in the general election. Deukmejian won the election by about 100,000 votes, about 1.2 percent of the 7.5 million votes cast. The victory came despite opinion polls leading up to the election that consistently showed Bradley with a lead, and despite exit polling conducted after voting closed that led some news organizations on the night of the election to make early projections of a Bradley victory. The discrepancy between the polling numbers and the election's ultimate results would come to be termed the "Bradley effect", which refers to a hypothesized tendency of white voters to tell interviewers or pollsters that they are undecided or likely to vote for a black candidate, but then actually vote for his opponent. Altogether Deukmejian's governorship was a departure from that of his predecessor, Jerry Brown. He vowed not to raise taxes, later saying that he was "business friendly". In addition, he presented himself as a law and order candidate, proposing new efforts to fight crime. He faced a Democrat-dominated California State Legislature during his two terms as governor. He was the sole Republican statewide officeholder until Thomas W. Hayes was appointed California State Treasurer, following the death of Treasurer Jesse Unruh. In 1983, Deukmejian abolished the Caltrans Office of Bicycle Facilities and reduced state spending for bicycle projects from $5 million to the statutory minimum of $360,000 per year. In 1984, he vetoed A.B. 1, the first bill to ban discrimination against gays and lesbians, which passed the Legislature. In 1986, Bradley sought a rematch and Deukmejian defeated him by a 61% to 37% percent margin. He was generally regarded as a moderate-to-conservative Republican. The Deukmejian administration entered office during a national economic recession. He first halted the hiring of new state employees and banned out of state travel for those in government. He rejected the legislature's demands for tax hikes, and pared $1.1 billion from its budget by selectively vetoing spending items. One year later, further cuts, along with a nationwide economic rebound that benefited the state, created a billion dollar surplus for 1985. His 1985 budget slightly increased spending in highway construction, but cut heavily into the education, health, Welfare and environmental budgets. For this he was roundly criticized, and the cuts probably led to his low polling numbers at the end of his tenure as governor. Three years later, Deukmejian faced his own billion dollar deficit. He supported a raise in the state minimum wage in 1989. Deukmejian largely made his career by being tough on crime. When he was in the legislature, he wrote California's capital punishment law. As a candidate for reelection, in 1986 he opposed the retention election of three Brown-appointed justices of the Supreme Court of California due to their consistent opposition to the death penalty in any and all circumstances. One of them (the best known) was Rose Bird, the first female Chief Justice of the Court (and the first one to be voted off). Deukmejian proceeded to elevate his friend and law partner, Malcolm M. Lucas, from Associate Justice to Chief Justice, and appointed three new associate justices. Under Deukmejian, the California prison population nearly tripled — as of December 31, 1982, the total prison population stood at 34,640 inmates. He increased spending for the building of new prisons. In 1988, then-Vice President George H. W. Bush considered Governor Deukmejian as a possible running mate for the presidential election that year. During a trade mission to South Korea in August, Deukmejian sent a letter saying he could not be considered for nomination, refusing to leave the governorship to Democratic Lieutenant Governor Leo T. McCarthy. Deukmejian did not seek reelection to a third term as governor in the 1990 gubernatorial elections. The Republicans instead nominated sitting United States Senator Pete Wilson, who defeated Dianne Feinstein in the general election. He was the last governor not affected by the two-term limit that was passed by voters in 1990. On October 1, 1989, Governor Deukmejian signed legislation authorizing the purchasing of health insurance by uninsured Californians suffering from serious illnesses, such as AIDS, cancer, diabetes, and heart disease, through tobacco tax revenues. In 1991, in his last days in office, he vetoed the property tax exemption bill that applied to companies building solar in California. This exemption was focused towards the Solar Energy Generating Systems (SEGS) plants then being built by Luz International Limited (Luz). The veto led to the bankruptcy of Luz. Deukmejian was a partner in the law firm of Sidley & Austin from 1991 until 2000 when he retired. He reentered public life by serving on special committees, including one to reform the California penal system, and a charter-reform committee in his hometown of Long Beach. He oversaw a revamping of the UCLA Willed Body Program after a scandal involving the sale of human body parts donated for science. In 2013, a courthouse in Long Beach was named in his honor. Deukmejian received an honorary doctor of laws degree from California State University, Long Beach, in 2008, because of his support for education, state law, and Long Beach. Deukmejian died at his home in Long Beach on May 8, 2018 at the age of 89. California Governor Jerry Brown said on Twitter: "George Deukmejian was a popular governor and made friends across the political aisle. Anne and I join all Californians in expressing our deepest condolences to his family and friends". ^ a b c "George Deukmejian, ex-governor of California, dies". San Francisco Gate. May 8, 2018. Retrieved May 8, 2018. ^ a b Luther, Claudia; Paddock, Richard C. (May 8, 2018). "George Deukmejian dead at 89, public safety and law-and-order dominated two-term governor's agenda". Los Angeles Times. Retrieved May 9, 2018. ^ a b c Ronayne, Kathleen; Oberthur, Anna; Bollag, Sophia; Thompson, Dan (May 8, 2018). "George Deukmejian, ex-governor of California, dies". Fox News. Associated Press. Retrieved May 9, 2018. ^ "Deukmejian". The CMU Pronouncing Dictionary. Retrieved December 21, 2011. ^ "Former California Gov. George Deukmejian, 89". Court House News. May 10, 2018. Retrieved May 10, 2018. ^ a b c d Luther, Claudia; Paddock, Richard (May 8, 2018). "George Deukmejian dead at 89, public safety and law-and-order dominated two-term governor's agenda". Los Angeles Times. Retrieved May 8, 2018. ^ "Leading the way to justice in South Africa". Los Angeles Times. Retrieved December 11, 2013. ^ "HONESTY AS THE BEST POLICY". Aurora Prize. Retrieved May 9, 2018. ^ a b Library, California State. "Governors of California – George Deukmejian". governors.library.ca.gov. Retrieved March 1, 2018. ^ a b "Former governor continues a quest". USC News. May 10, 2018. ^ "Deukmejian, George". Our Campaigns. May 10, 2018. ^ "Former California Governor Deukmejian Dies at 89". Long Beach Post. May 10, 2018. ^ a b c d "Former Gov. George Deukmejian dies at 89". Sacramento Bee. May 8, 2018. Retrieved May 8, 2018. ^ Dolan, Maura (September 29, 2016). "Former Chief Justice Malcolm Lucas, who steered state's top court to the right, dies at 89". Los Angeles Times. Retrieved October 1, 2016. ^ a b c d e f g h i "George Deukmejian, two-term Calif. governor who espoused law and order, dies at 89". The Washington Post. May 9, 2018. Retrieved May 10, 2018. ^ BALZAR, JOHN (August 20, 1985). "Governor a Long-Term Participant in Politics of Capital Punishment". Retrieved March 1, 2018 – via LA Times. ^ a b "George Deukmejian dead at 89, public safety and law-and-order dominated two-term governor's agenda". The Los Angeles Times. May 10, 2018. Retrieved May 10, 2018. ^ "What California drivers should remember on 4/20, now that cannabis is legalized". Sacramento Bee. May 10, 2018. Retrieved May 10, 2018. ^ "Former California Governor George Deukmejian Dies at 89". ABC News. May 10, 2018. ^ "Dan Walters: For Joe Shell, character counted". Press telegram. Retrieved May 10, 2018. ^ Times, Wallace Turner and Special To the New York. "MAN IN THE NEWS; A NEW CHIEF IN CALIFORNIA: GEORGE DEUKMEJIAN JR". Retrieved August 18, 2018. ^ a b c d e "George Deukmejian, 2-Term California Governor in the '80s, Dies at 89". The New York Times. May 8, 2018. Retrieved May 8, 2018. ^ "California Elections : Deukmejian, Bird Sharpen Attacks as Vote Nears". The Los Angeles Times. October 18, 1986. Retrieved May 10, 2018. ^ a b c d "THE ELECTIONS: THE STORY IN SOME KEY STATES; DEUKMEJIAN AND CRANSTON WIN AS 3 JUDGES ARE OUSTED". The New York Times. Retrieved May 10, 2018. ^ Perez, Simon. (October 9, 2008). "Could Bradley Effect Change November Election? Archived December 5, 2008, at the Wayback Machine" KPIX-TV, "Political Consultant Don Solem explains: 'It's not so much they're afraid to say it as they think it might be taken the wrong way.' Solem said the Bradley Effect is also known as social desirability bias." ^ a b Rojas, Aurelio. (October 9, 2008). "California poll on Prop. 8 could show 'Bradley effect' Archived October 21, 2008, at the Wayback Machine" Sacramento Bee, "'Anyone who studies survey research will tell you one of the biggest problems we encounter is this notion of social desirability bias,' [Patrick Egan, a professor of politics at New York University] said." ^ "George Deukmejian, Ex-Governor of California, Dies". US News. May 8, 2018. Retrieved May 8, 2018. ^ "George Deukmejian, former California Gov., Dies at 89". Idaho Statesman. May 9, 2018. Retrieved May 9, 2018. ^ Ellis, Virginia (May 10, 1990). "No Tax Hikes While He's in Office, Governor Vows". Los Angeles Times. Retrieved May 10, 2018. ^ "Long Beach's George Deukmejian: At 83, a quiet retirement". Press-Telegram. July 4, 2011. Retrieved May 10, 2018. ^ Alan Wachtel (1990). "A History of CABO" (PDF). Bicycle USA. Retrieved April 17, 2009. ^ "California rider-ed threatened by veto". American Motorcyclist. Pickerington, Ohio: American Motorcyclist Association. July 1985. p. 55. Retrieved May 8, 2018. ^ a b c "George Deukmejian, ex-governor of California, dies at 89". Los Angeles Daily News. May 8, 2018. Retrieved May 8, 2018. ^ "2011: Milestones and Accomplishments" (PDF). Governor of California. May 10, 2018. ^ "NEWS ANALYSIS : A Split Decision on Deukmejian's Legacy : Governor: Increasing prison space and imprint on judiciary are among his accomplishments. Critics say he lacked vision and was stubborn". The Los Angeles Times. December 30, 1990. Retrieved May 10, 2018. ^ "CALIFORNIA TAXPAYERS TO GET $1 BILLION IN REBATES". The New York Times. July 8, 1987. Retrieved May 10, 2018. ^ "The Power of American Governors" (PDF). May 29, 2012. Retrieved May 10, 2018. ^ Magnuson, Ed (January 17, 1983). "New Governor, New Style". Time. Retrieved January 21, 2011. ^ Stanley, Alessandra (January 23, 1984). "California's Down-to-Earth Duke". Time. Retrieved January 21, 2011. ^ "Homeless Activists Boo Wilson : Deficit: Governor defends his program in the face of anger directed at his plan to cut benefits for the poor to avert a budget shortage". The Los Angeles Times. May 13, 1990. Retrieved May 10, 2018. ^ "Deukmejian Appeals for Support of Worker Compensation Reform". The Los Angeles Times. May 12, 1989. Retrieved May 10, 2018. ^ "Judges and the Politics of Death" (PDF). Corwin. July 21, 2011. Retrieved May 10, 2018. ^ a b The Associated Press (August 5, 1988). "Californian Removes Himself From Running for No. 2 Spot". The New York Times. Retrieved January 21, 2011. ^ "Governor OKs Insurance Aid to Catastrophic Illness Victims". Los Angeles Times. October 2, 1989. ^ a b c Madrigal, Alexis (2011). Book Factory (ed.). Powering the Dream: The History and Promise of Green Technology. Da Capo Press (Perseus Book Group). p. 132. ISBN 978-0-306-81885-1. ^ "ANCA-WR Mourns Gov. George Deukmejian's Passing". Asbarez. May 10, 2018. Retrieved May 10, 2018. ^ "UCLA Suspends Body-Donor Program After Alleged Abuses". The Los Angeles Times. March 10, 2004. Retrieved May 10, 2018. ^ Puente, Kelly (August 27, 2013). "City's new courthouse shines". Orange County Register. Retrieved May 9, 2018. ^ "George Deukmejian". California State University. Retrieved May 10, 2018. ^ "Jerry Brown on Twitter". Twitter. May 8, 2018. Retrieved May 8, 2018. Wikimedia Commons has media related to George Deukmejian. This page was last edited on 17 April 2019, at 23:04 (UTC).